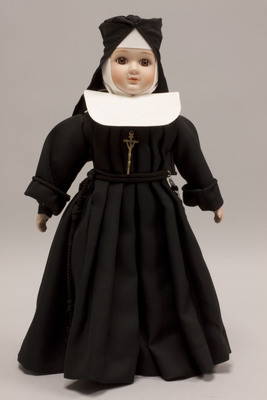 "Doll wearing habit worn by Sisters of Saint Joseph of Carondelet"
Porcelain doll is wearing a habit typical of the Sisters of Saint Joseph of Carondelet. The original order was founded in 1650 in Le Puy, France. In 1836 six sisters were sent to Carondelet, Missouri. The doll is wearing a black habit with black veil, white paper collar, and white wimple and coronet. A metal crucifix hangs from a black cord around her neck. A rosary hangs from a black cord around her waist.